It's no fun to end a busy work day by staring blankly into the refrigerator wondering what to fix for dinner. Fortunately, a little planning can make getting dinner on the table much easier - and tastier - for everyone. A wise plan takes into account not only the family's hectic schedule, but also cleverly uses leftovers and other timesaving tricks. Having a nightly theme like "breakfast for supper" can make meal planning fun and add variety to the weekly routine. The classic Sunday meal is roasted chicken, and cooking one from scratch is simple. Time-pressed families can buy fully cooked rotisserie chickens at the supermarket deli. Buy or prepare two chickens - one to eat now, the other for a later recipe. 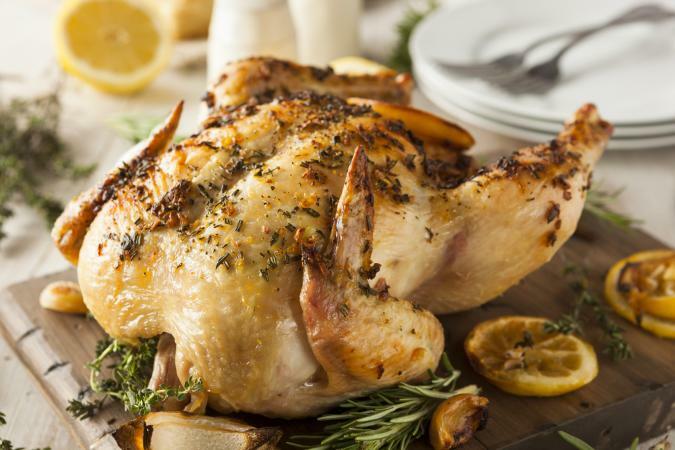 Roasted chicken - Fresh herbs and lemon add flavor to basic roasted chicken. Steamed vegetables - Wash and cut fresh broccoli and cauliflower into florets and toss with sea salt and olive oil after steaming. Biscuits - Purchase from the supermarket bakery, or try delicious self-rising flour biscuits. Egg custard pie - This classic pie recipe will bring a sweet and nostalgic end to the meal. Use some of the extra rotisserie chicken from Sunday's meal to enhance a classic Caesar salad, a perfect ending to the start of a brand new work or school week. Classic Caesar salad - A classic version makes a great salad, and top with leftover chicken from Sunday. Toasted biscuits - Slice the left-over biscuits from Sunday's dinner and toast lightly in the toaster oven. Brownies - Try an easy black bean brownie recipe to stir up a batch of heathy brownies. Who said vegetables need to be boring? Liven things up with a delicious Indian vegan dish. Vary the amount of chili pepper to manage the level of hot spices to taste. Cool the spice with a frozen treat for dessert. 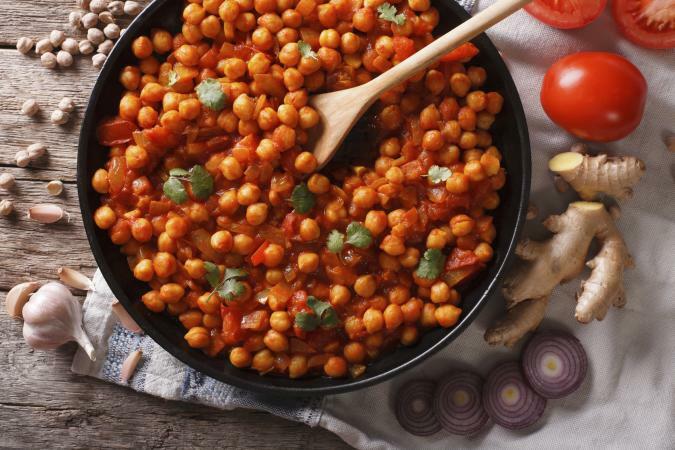 Indian chickpea curry - This chickpea recipe calls for a mix of common pantry ingredients like clove and cinnamon that combine to make a delightfully different dish. Plain rice - Try a different type of rice such as basmati or jasmine rice for a new twist. Ice cream or frozen yogurt - Keep dessert light and simple to cool the Indian spices from the entree. Try a French vanilla or peach ice cream. Turn things upside-down by serving breakfast classics for dinner to shake things up mid-week. Kids love the oddity of noshing on morning favorites at night. French toast - This easy recipe works with whole-grain or white bread. Traditional pancakes - Make fluffy pancakes for those who don't care for French toast. Bacon or sausage - Buy precooked breakfast meat to save time and clean-up. Cooking bacon in the oven is fairly simple if you don't mind the clean-up. Fresh cut fruit - Try some orange and apple wedges to add a kick of vitamins and fiber. As the week winds down, the crock pot shows its true value as a set-it-and-forget-it kitchen tool. 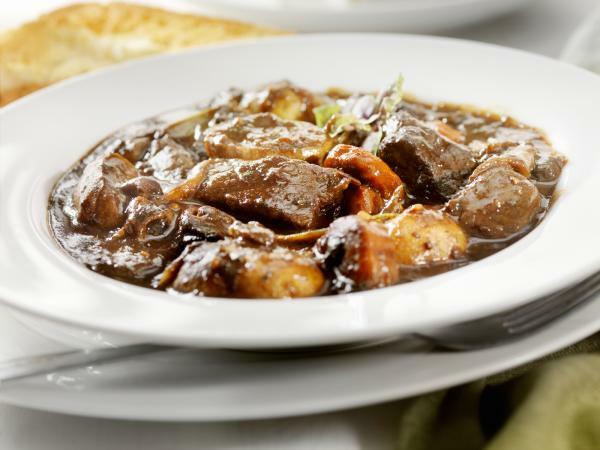 A hearty beef stew can be assembled the night before and refrigerated; let it simmer away all day in a crock pot and it will be ready at the end of the work day. Crock pot beef stew - This slow cooker recipe features beer along with the classic carrots, potatoes, and onions to create a delicious one-dish supper. Tossed green salad - Mix up a tangy balsamic vinaigrette dressing to drizzle on bagged salad greens and grape tomatoes. Crusty bread - Purchase French bread at the supermarket and toast it in the oven to serve with the stew and salad. Brownie-topped ice cream - Enjoy crumbled brownies from Monday on top of a scoop of leftover ice cream. Now that the work week is at an end, it's time to relax. Pop some big russet potatoes into the oven or microwave, reheat yesterday's beef stew, or Tuesday's Indian curry, and enjoy a simple hearty dinner. Baked potatoes - Make oven baked potatoes and top with left-over Crock Pot Beef Stew or Indian chickpea curry. If you don't have leftovers, there are plenty of other options for topping a baked potato, too, from salmon to pepperoni to microwaved frozen vegetables with cheese sauce. Berry parfait - A healthy and fresh parfait is a sweet and simple ending to dinnertime. Everyone loves a fiesta, but it doesn't need to be complicated. Combine home cooked fare prepared with salad bar ingredients (such as sliced peppers and onions) for a spicy dinner the whole household will love. The weekend is the perfect time for this festive meal. Sangria - A chilled wine beverage gets a fruity twist in this classic Sangria recipe. Pick up fruit juice for kids and non-drinkers. Tortilla chips and guacamole - Try this easy guacamole recipe for the popular creamy avocado dip. 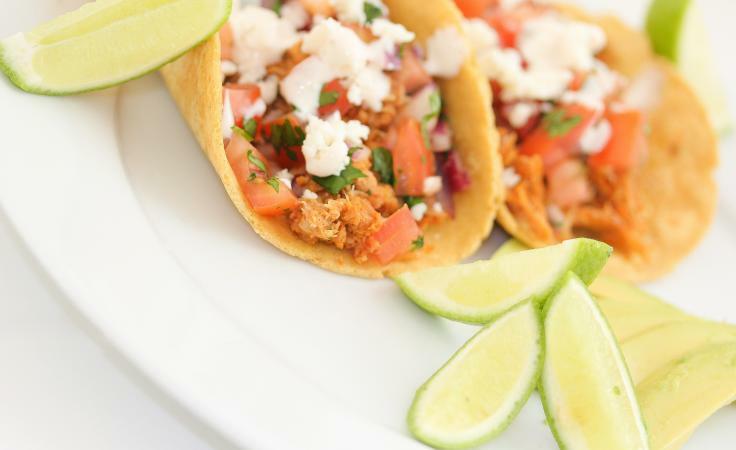 Chicken tacos - Make chicken tacos that feature a medley of cumin, chilis, and fresh lime juice along with fresh chicken. Mexican-style baked black beans - Beans, corn, spices and cheese combine in a zesty vegetarian bean recipe. Flan - Try a flan recipe for a velvety, chilled baked custard with caramel sauce. Everyone in the household who eats can participate in meal planning and preparation. Even young children can suggest favorite dishes, wash and peel vegetables, and load the forks into the dishwasher. Better still, farm out an entire weeknight to a particular family member for cooking and cleaning; this fosters an appreciation of all it takes to put a great dinner on the table.